These last couple weeks I have been down and out with seasonal Manflu. Urgh. Must have been those Plague minis. So I have not been able or in the mood to paint much, and what I did do, took ages longer than usual. 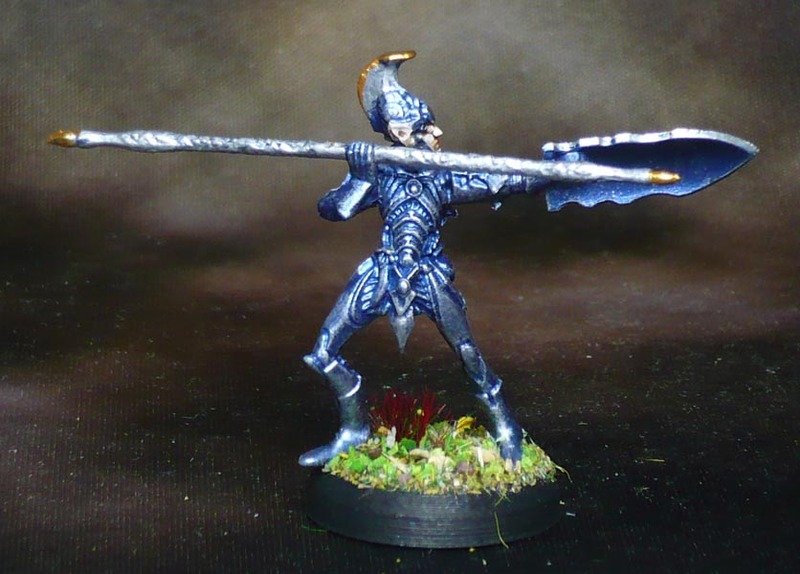 When I first saw the Mantic Elves these minis struck me as a bit boring, being all reedy and stick thin. Not that I mind their esthetique as such but I would have liked them to be a bit more chunky, which would translate into deeper details. I like deeper details. They are easier to paint. 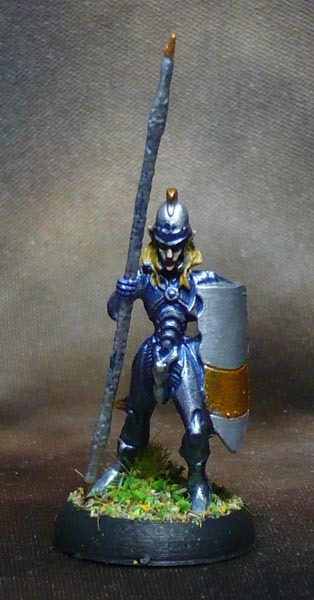 I have a couple of elven sprues in my mountains of minis, but I have not bothered with building them before now. In the bobbybox, I got three sprues with 30 of them plus some casualties. I wanted to do these super fast, so I would not get fed up with them and the bobbybox already. 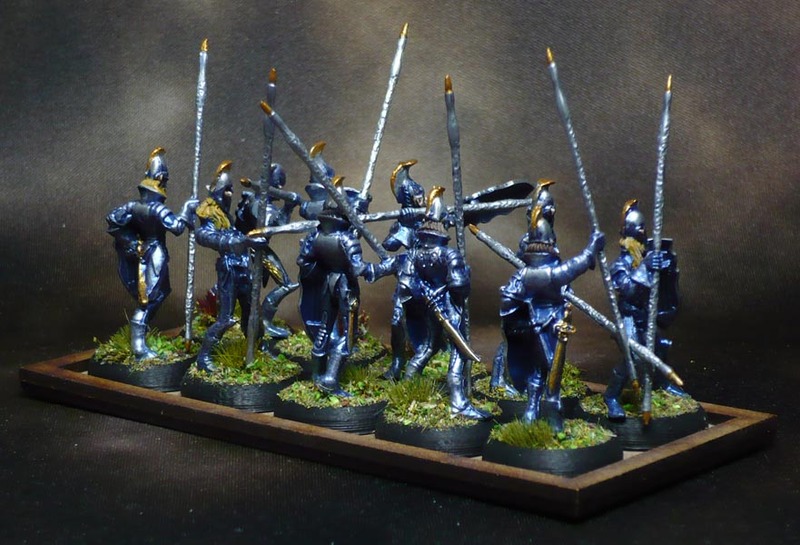 For some reason I basecoated them in Vallejo Game Air French Blue. This metallic colour turned out rather stronger than I had thought after just one coat. Which is good. I can work with that. My thinking was that the strong blue would permit me to drop the wash or shading stage entirely, and keep the highlights to a single drybrush, dot in some skin, hair and other details here and there, and hey presto. And it worked a charm. Actual painting time per mini after the blue metallic coat was on is reduced to just a few minutes each. 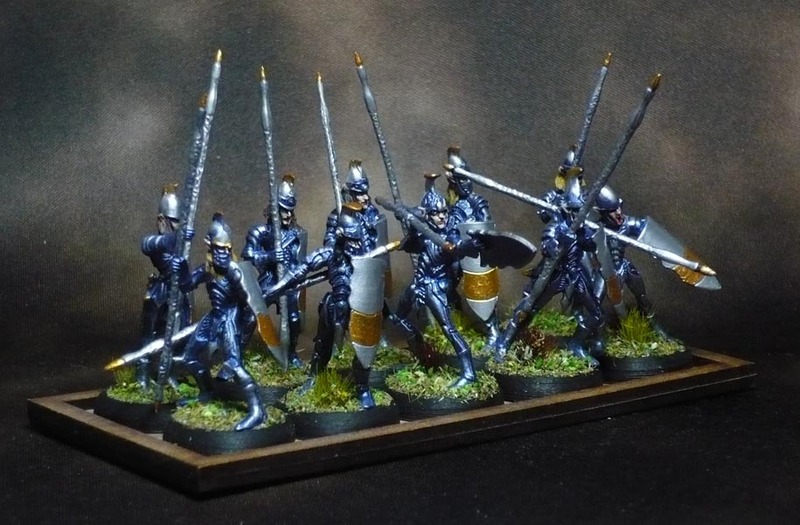 A drybrush plus some hightlighting here and there with Army Painter Shining Silver. The gold bits are Vallejo Glorious Gold. 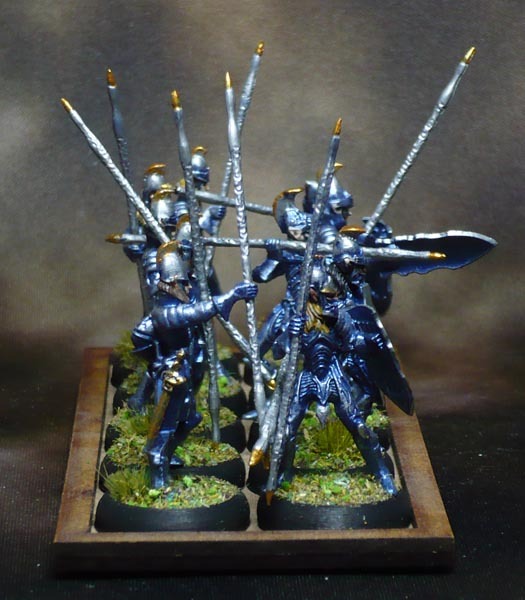 The Shield and spear needed two coats of both silver and gold to cover the blue properly. The skin is Reaper Fair Skin, washed twice with army painter soft tone, and highlighted with more Reaper Fair Skin. Blonde hair is Vallejo Plague Brown hightlighted with Reaper Dirty Bone, brown hair is Army Painter Oak Brown with mixed highlight. Eyesockets are black with leather white dots. In my dotage I am finding it increasingly difficult to do eyes. I simply can’t see as well as before. I have found that so long as you do the skin and face properly, you can skimp on the rest without it being too noticable at first. Especially when doing mass-battle units. I used my own 3d printed bases 20mm round lipped with 15mm hole for older Mantic minis. The round bases look better than squares when used as individuals, and allows for fast ranking up as you can rotate each mini to fit next to the others, which square bases do not allow for. 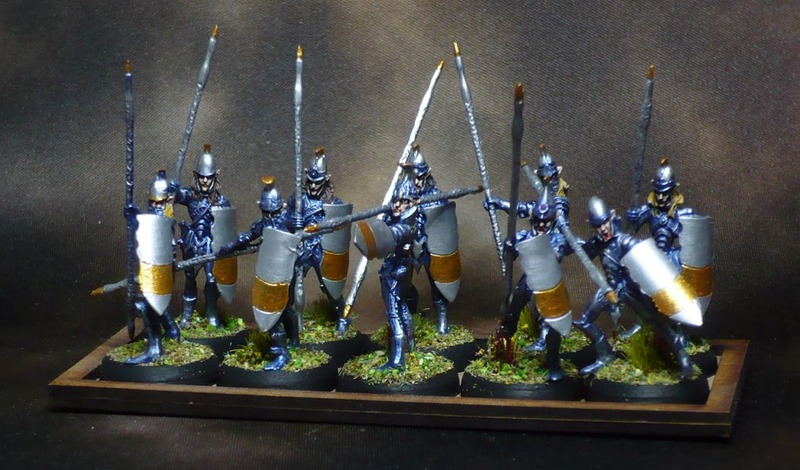 I think I will be doing the 20 bowmen in a similar style, but with reversed colours on the shields and weapons. 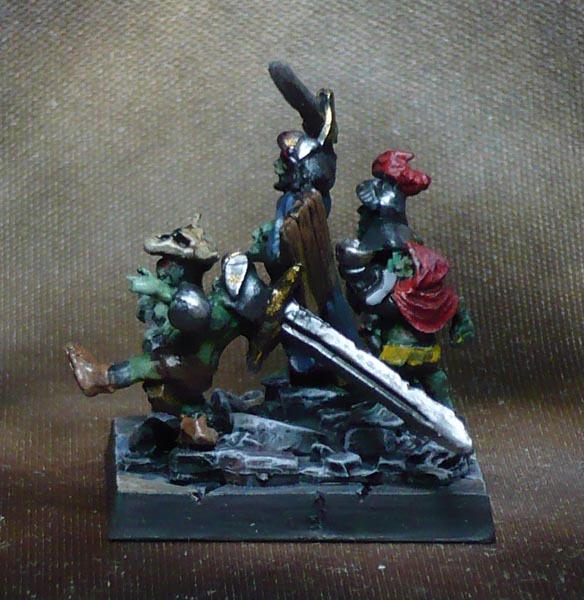 I tried drybrushing a bowmen with gold, but that turned out bad. I think I will do silver like the above. 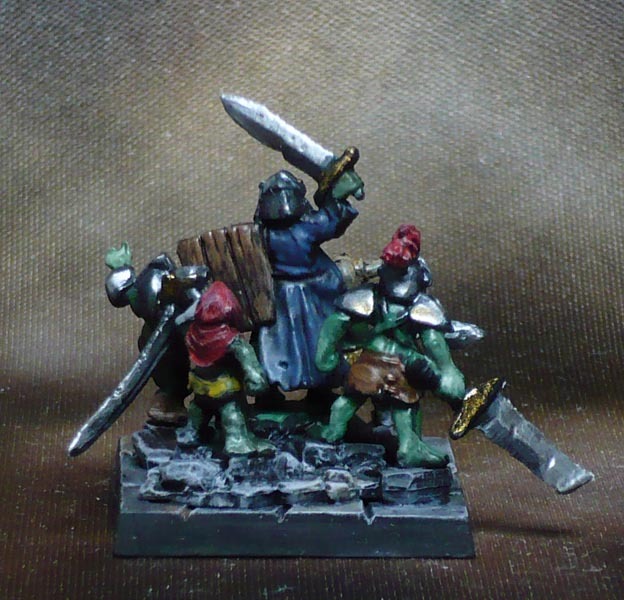 A bunch of miniscule goblins crowding a 20mm base. Not the easiest to get at to paint. 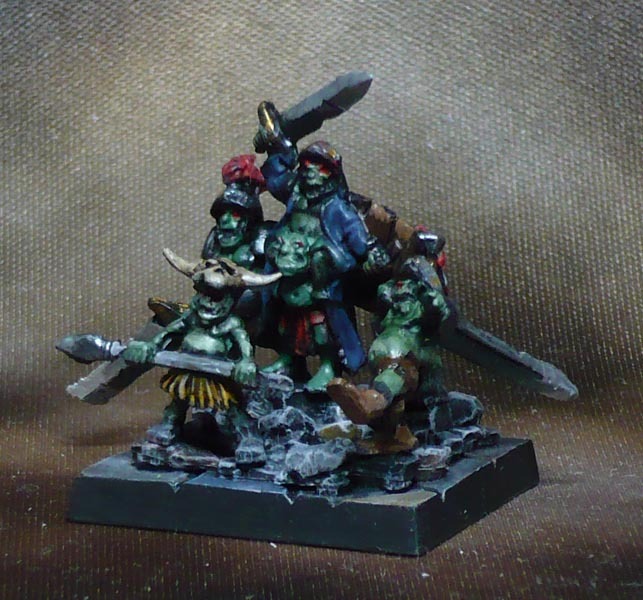 Ace painting as always – question though – what’s the difference between an Orcling and a Goblin? 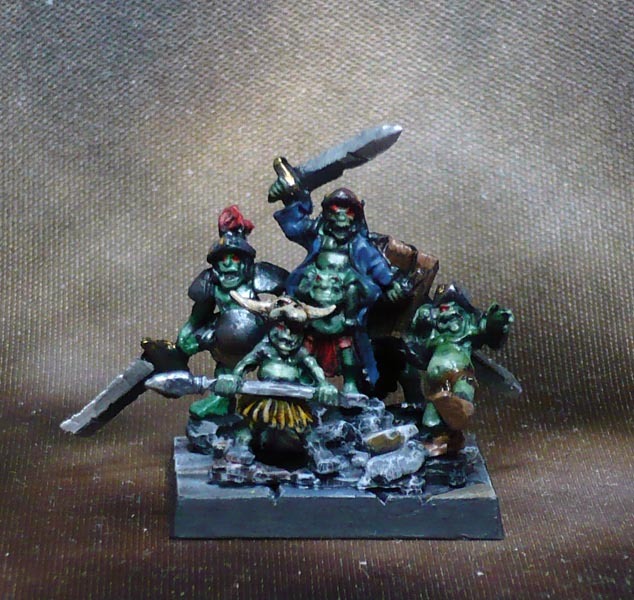 Orclings are Mantics version of Snotlings, if you are familiar with Warhammer. Basically, they are very small, much smaller than goblins. 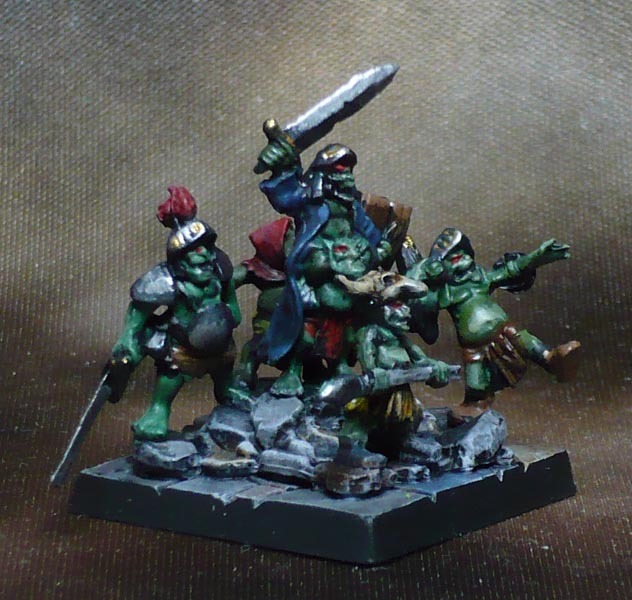 They are a small swarm of 6 individuals on a 25mm base, where a goblin or orc are single minis to a base.